My time in L.A. has been anything but dull, to say the least. One of the things that my Lady & I like to do is to pack up the kiddos and walk around the local “swap meet” for a few hours on the weekends that we have them. The weather is usually beautiful and it is fun to get out for a bit. Usually you can find some fruit at good prices and a trinket here or there. Usually the people watching is the best on Sundays and the kids like to ride the ponies around the parking lot on the way out. countless tables and heaps of items, something caught my eye. Could it be? 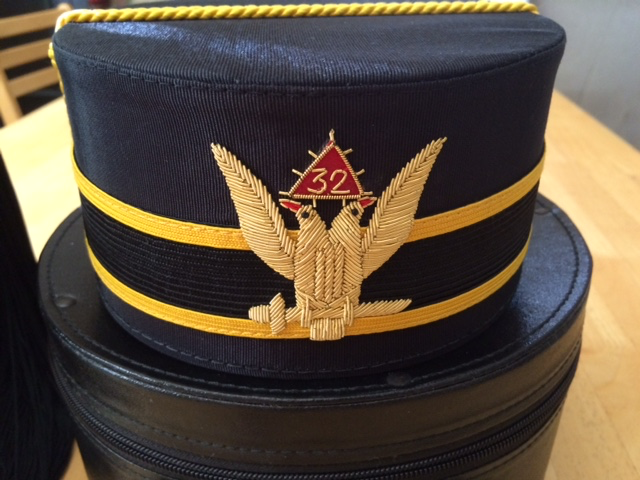 I was a little bit away, but I swear I saw a Shriner’s Fez. My half left turn became a b-line for this fellow and his tables. Sure enough, he had a small sampling of Masonic items laid out for sale. A short conversation later revealed that he had purchased a storage locker that was in default and these were inside. Well, being me, I couldn’t let these items sit on a table at a sap meet. They hold too much meaning for me, and they weren’t even mine. I have to say, it wasn’t until I caught back up with my Lady and we stopped for some fruit, that I got a chance to actually study the items I picked up. I was immediately blown away with what I had found, simply by chance. 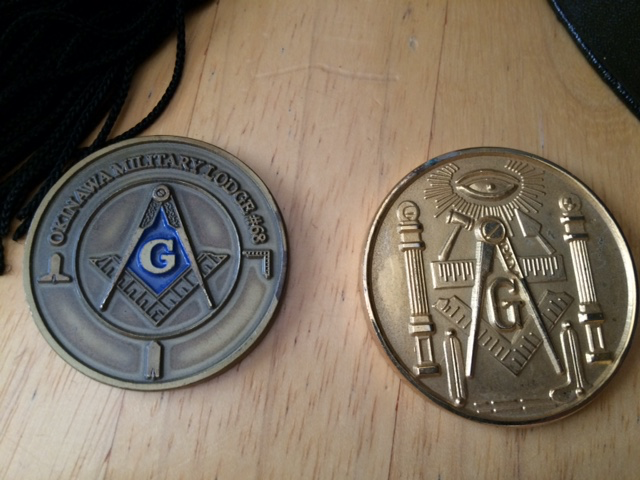 The first thing I grabbed out of the hat case was a challenge coin. 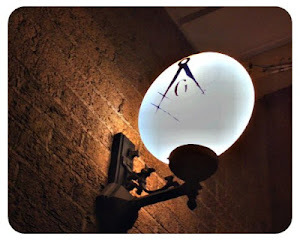 I almost couldn’t believe the writing… Okinawa Military Lodge #68. Was I really holding a challenge coin from a Military Lodge in Japan!?!? I flipped the coin over and and on the bottom it had F&AM (PHA). Not only is this from the other side of the world, but it was PHA. 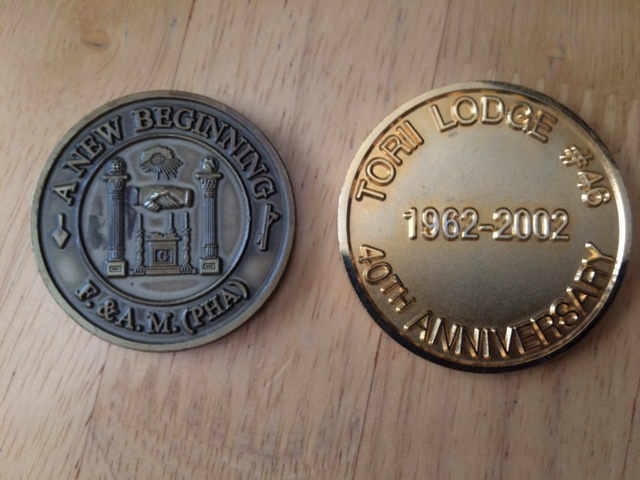 I grabbed the other coin out of the box and it was a 40th anniversary coin from Tori Lodge #46, also from PHA from Japan. As much as I loved spending time with the family, I couldn’t wait to get home and do some research. 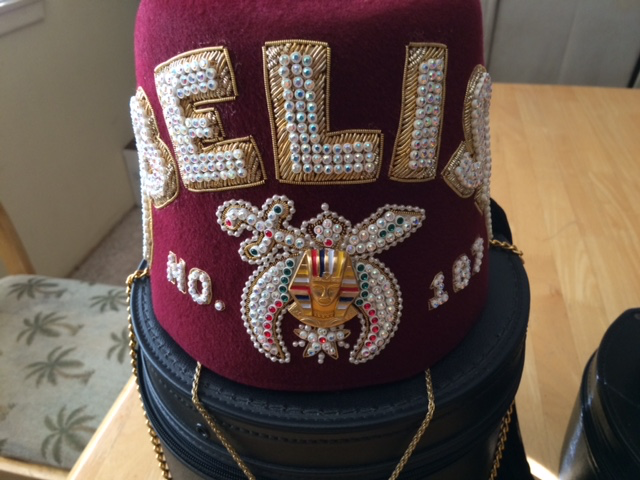 The Fez was adorned with jewels that spelled out Obelisk No. 187. Sure enough, a PHA Shrine Temple in Okinawa, Japan. That only leads me to believe that this Brother was also a member of the PHA Scottish Rite there as well. I will never understand what made me look right when I was going left, but I am so thankful that I did and that I was able to preserve these items. They will be locked away in my private collection for sometime… most likely forever, unless the right opportunity presents itself and I feel I should let them go. We have a beautiful, 100yo Lodge building, with most of the 6 floors just laying dormant. It's my hope to one day have a museum of sorts, a place for all the found relics to reside.